Mi Chunche: Kindle in Costa Rica - Will it work? The short answer... YES, but there are a few caveats. Recently, Google searches for the words "Kindle Costa Rica" puts our blog, Mi Chunche, in the top 10 results. Since we get so many of these "hits", I thought I would dedicate this post to a detailed explanation of how the various versions of Kindle actually work in Costa Rica. 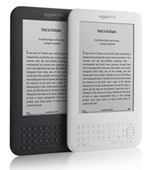 Amazon's 3rd generation Kindle introduced Wi-Fi. This gives it the ability to connect to a wireless network, such as a home wireless or Wi-Fi Hot Spots. Once configured to connect to the wireless network, ebooks can be downloaded directly to the Kindle. While connected, Amazon's Whispersync automatically syncs your place across any other devices you have, so you can pick up where you left off. This version does not have a 3G cellular connection. You can download ebooks directly to the Kindle Wi-Fi device while in Costa Rica as long as the device is connected to a Wi-Fi network. Another version of Amazon's 3rd generation Kindle supports both Wi-Fi and 3G cellular connection via Whispernet. The Wi-Fi on this device works exactly as described above. The 3G cellular connection, Whispernet, uses Sprint. Since Sprint is not a GSM network, the Kindle can't roam on I.C.E. 's (Costa Rica’s government-run, phone, internet and cable network), thus no direct internet connection. You can download ebooks directly to the Kindle 3G & Wi-Fi device while in Costa Rica as long as the device is connected to a Wi-Fi network. The earlier versions of Amazon's Kindles only support a 3G cellular connection via Whispernet. The 3G cellular connection, Whispernet, uses Sprint. Since Sprint is not a GSM network, the Kindle can't roam on I.C.E. 's (Costa Rica’s government-run, phone, internet and cable network), thus no direct internet connection. You cannot download ebooks directly to the earlier versions of the Kindle devices while in Costa Rica. However, if you have a computer, with an internet connection, you can still download any of your Kindle content archived on Amazon.com to the computer and transfer it via USB to your Kindle. In summary, if you don't have a wireless connection, you will have to download ebooks to a computer and transfer them to the Kindle with via a USB cable connection. I have a Kindle 2 and John has the Kindle 3G Wi-Fi. He downloads directly from Amazon through our wireless network. I have to download ebooks to the PC first, and then transfer them to my Kindle 2, but it is painless. We love our Kindles! If you're thinking about bringing a Kindle to Costa Rica, do it. You won't regret it. Please read the comment section for further information. Not a big deal as neither one of the GSM versions of the Kindle work in Costa Rica's cellular network, still I will like to point out that you are mistaken in terms of what technology / network the Kindle 2 and 3 use. At one point the original Kindle did use Whispernet on Sprint, so that in that regard you are right that the Sprint's (CDMA) and ICE's (GSM / 3G) networks are not compatible, but that is not the reason why Kindle does not work over the cell phone network. A simple way to tell that at least the Kindle 2 and 3 work on GSM / 3G is if you look at the international coverage map that can be located in the Amacon.com web site. Only very few countries still operate on CDMA , yet the international coverage is very extensive, including those countries that do not operate on CDMA. The new Kindle 3 uses the AT&T network, which at this time is compatible with ICE's GSM/3G network. The problem lies in the fact that ICE, being pretty much the last monopolistic player in the americas, with perhaps the exception of ETECSA in communist Cuba, has decided not to sign/honor the Amazon Whispernet roaming agreement that most other countries have honored. I can technically ""see"" the ICE network on both my US versions of my Kindle 2 and 3 (with a Geeky hack); however, I cannot connect to the network because there is no ICE / Amazon agreement. I am hoping that either Movistar or Claro will work with Amazon once they enter into the Costa Rican market later this year. HOWEVER, it should not be a huge issue for the Kindle 3, as free Wifi is widely available at most malls, restaurants and fast food joints (McDonalds!) and other public places in Costa Rica. Thanks for the information. I'm planning a 5 week trip to Costa Rica in June and was considering the Kindle Fire to take with me. My main use would be email and Internet access along with a small, portable unit to carry with me. I appreciate your review and related information.